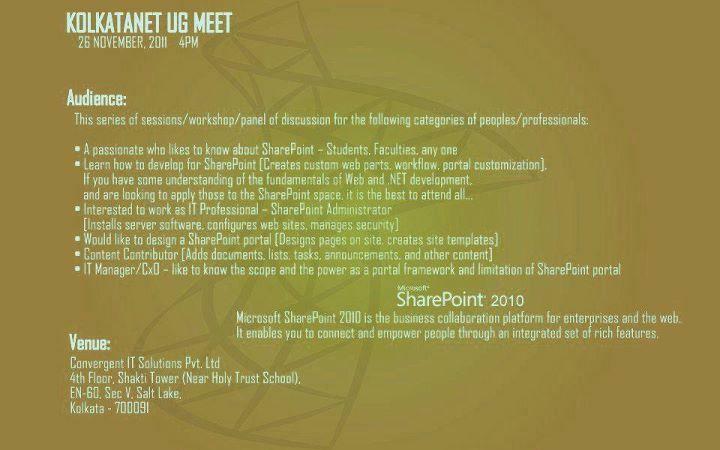 I am glad to announce that the Kolkata User Group is organizing a meet on 26th November, 2011 on Designing and Developing Sharepoint Applications. Microsoft SharePoint is designed as a broad, central application platform for common enterprise web requirements. SharePoint’s multi-purpose design allows for managing and provisioning of intranet portals, extranets, websites, document & file management, collaboration spaces, social tools, enterprise search, business intelligence, process integration, system integration, workflow automation, and core infrastructure for third-party solutions. SharePoint’s core infrastructure is also suited to providing a base technology platform for custom developed applications. Microsoft SharePoint 2010 is the business collaboration platform for enterprises and the web. It enables you to connect and empower people through an integrated set of rich features. Don’t miss the chance and I hope to meet you guys at the venue! Share this with your friends/colleagues and mark the event on your calendar. Show your interest by joining the event here.